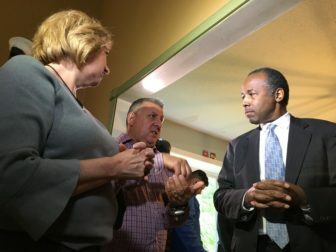 Maggie and Vincent Perracchio explaining about their crumbling foundation to U.S. Housing Secretary Ben Carson. On an early morning last winter, Maggie and Vincent Perracchio thought someone dropped something when they heard a loud bang in their house. The noise was actually a reverberation of a new vertical crack in a wall of their basement—one that had exposed the outdoors. The couple has heard several of those bangs over the last three years as their Willington home collapses in slow motion. They are among thousands of residents around central and northeastern Connecticut coping with crumbling concrete foundations that threaten foreclosures, evaporating tax bases, and emotional turmoil. 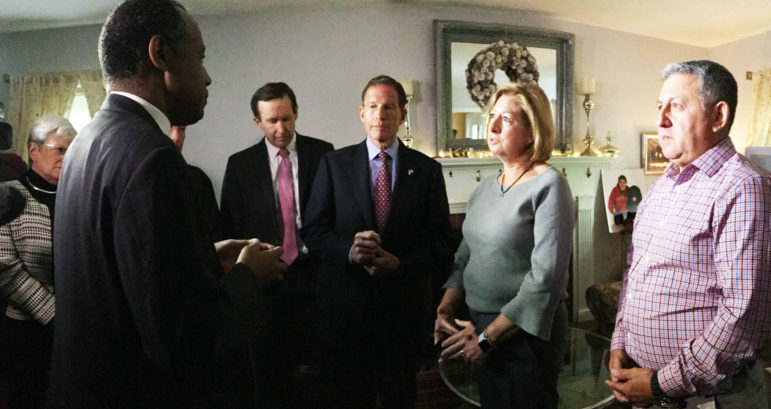 On Monday, U.S. Department of Housing and Urban Development Secretary Ben Carson got a close-up look at the damage to the Perracchio’s home with Sen. Chris Murphy, Sen. Richard Blumenthal, U.S. Rep. Joe Courtney, D-2nd District, and Lt. Gov. Nancy Wyman. Carson said solving the problem will require collaboration from Congress, federal agencies, state and local officials, and the private sector. The shifting foundation of the Perracchio’s home in Willington is causing upstairs walls to separate. The Perracchios led Carson through different parts of their home, showing him deep, extensive horizontal cracks in their basement and fissures that are slowly pulling walls and floors apart. An estimated 30,000 homes in eastern and central Connecticut are contaminated with aggregate from a Willington quarry containing pyrrhotite, a mineral that causes massive cracking in foundation concrete when exposed to water. The home visit came after Carson accepted an invitation from Murphy to see the crumbling foundations in Connecticut first-hand. Carson said he was flabbergasted insurance companies got away with not covering the damage. 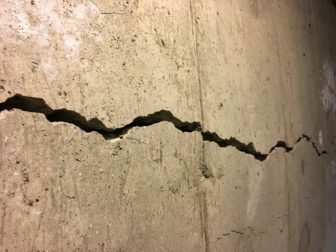 Eric George, the president of the Insurance Association of Connecticut, said the state’s insurance industry is deeply sympathetic to homeowners dealing with crumbling foundations. “Unfortunately, this has never been an issue covered by insurance companies, it does not cover defective product and it does not cover crumbling foundations,” George said. One of the many cracks caused by the failure of the contaminated concrete. 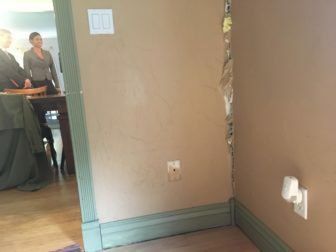 Vincent Perracchio said repairing all the damage in their basement and garage would cost about $220,000 alone, not including the work needed on the rest of the house. He said they will likely move in the fall, but will continue to pay the mortgage and insurance while waiting for potential relief funding. Last month, the General Assembly voted to impose a $12 annual surcharge on homeowners’ insurance policies, contributing about $9.3 million yearly to a relief fund for residents facing complicated repairs costing as much as $250,000. The federal government has dispatched the Corps of Army Engineers to study the situation, while refusing to provide disaster relief through the Federal Emergency Management Agency. The state budget approved last fall authorizes the borrowing of $100 million over five years for relief. Murphy and Blumenthal have co-sponsored two bills to help homeowners with crumbling foundation get relief. One would provide up to $100 million over five years from HUD to states like Connecticut that have created programs to help damaged homes built with the contaminated concrete. Another would create a new $100 million grant program within FEMA that would allow qualified homeowners to apply directly through the agency for funding. Blumenthal said the full extent of the problem isn’t known yet, and some people are reluctant to test their homes while there isn’t relief because the value of their homes will plummet if their foundations are contaminated. U.S. Housing Secretary listens to Maggie Perracchio and her husband Vincent of Willington. Connecticut Sens. Richard Blumenthal and Chris Murphy, U.S. Rep. Joe Courtney, D-2nd District, and Lt. Gov. Nancy Wyman accompanied Carson’s visit. The lawmakers have proposed two bills and have made other efforts to address the problem afflicting hundreds of homes in northeast Connecticut.